The organisers of Games Fleadh, Ireland’s version of the Oscars for undergraduate game designers and developers, are calling for the scheme of tax relief for investments similar to that afforded to Irish made film and television productions to be extended to the domestic game design and development sector. Some of the biggest names in the gaming industry will gather at the Limerick Institute of Technology (LIT) campus in Thurlestomorrow (Wednesday, March 9th) to participate in Games Fleadh 2016, an all-island games design and development competition for third-level students. Supported by Microsoft Ireland, EA Games, Ubisoft and the Irish Computer Society, the 13th annual Games Fleadh will feature the Game Studio Tower Defence competition and Robocode. Event organisers say the provision of tax relief to Irish games designers and developers would “encourage more entrepreneurship and consolidate the strong growth” recorded in the sector as evidenced by job announcements from EA, Black Shamrock and ZeniMax, as well as relocation from Silicon Valley to Galway of Romero Games. “We do need to level the playing field and encourage investment in this creative innovative space, this industry is no different to the movie or TV sector as it is creative, dynamic and risk taking is involved. Investment tax relief schemes in the game design and development sector are needed to encourage more entrepreneurship and the creation of Irish jobs,” said Dr. Liam Noonan, event organiser and lecturer at LIT’s Game Design and Development degree in Thurles at today’s launch of Games Fleadh 2016. “This high profile move to Ireland by John and Brenda Romero whose title credits include ‘Doom’, ‘Dangerous Dave’, ‘Quake’, ‘Wizardry’ and ‘The Mechanic is the Message’ is an endorsement of the potential of this sector to develop. EA have continued to grow their presence in Galway and with the addition of their QA team are creating job opportunities for Irish game developer graduates. The recent establishment of the Irish game makers association ‘Imirt’ lends further evidence to the growth and optimism in this sector.” said Dr. Noonan. Games Fleadh will feature a keynote talk by John Romero as well as talks by industry professionals from EA, Microsoft and Fungus Games. This year, a new innovation sees the inclusion of startup session which will provide insight from recently formed Irish startups in the game design and development sector. Games Fleadh will also host a number of competitions on the day including an EA FIFA 2016 and UFC tournaments, with numerous EA titles being provided as prizes for the various competitions. To celebrate the launch of Ubisoft’s Tom Clancy’s ‘The Division’ on March 8th, the game will be playable at Games Fleadh. Once gamers have had a chance to play, developers at Ubisoft Massive Entertainment will answer any questions and feedback on comments about The Division. There will also be some great Tom Clancy’s The Division prizes in the Games Fleadh raffle. Games Fleadh 2016 is open to the public for free. Online registration is available at www.gamesfleadh.ie. 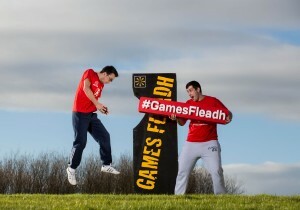 For more visitwww.twitter.com/gamesfleadh or search Twitter #gamesfleadh.